I am no longer running my own company. I have decided that I want the sewing I do at home to be for fun and for me and my family. 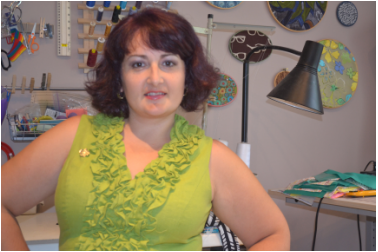 ​I am working a Intown Quilters Fabric and Yarn and will still be teaching sewing lessons including private lessons at the shop. You can contact me to set up a private lesson or check out the shop's website to see all the fun classes we offer. There are many great instructors teaching at Intown. The name of my website was changed to "The Magical Unicorn of Sewing" in December 2018. Many of my friends have given me this nickname so I have decided to just go with it. I would love to hear from you. Got any fun projects you are working on? Pop me an email and tell me all about it. Chrissy Weeks, creator, owner, doer of all things awesome and fun. In 2008 I quit my desk job to spend more time with my family. In 2009 I re-kindled a long lost love... sewing! Sewing and I have been having a tumultuous affair for years now. But we have gotten more serious in recent years. In 2009 I was sewing kids clothes because I could not find things that fit my daughter. That is where the brand names Stems came from. Things have changed and my business has changed with it. I still make clothes for her, but now I work at Intown Quilters Fabric & Yarn where I also teach sewing. I want to pass on the love of sewing. There is an intense satisfaction that comes from taking a piece of fabric and turning it into something you can wear or use. I love making clothes, accessories and other useful items. So the picture on the right is pretty old, like it is from 2011 I think. But look how cute I was!! !